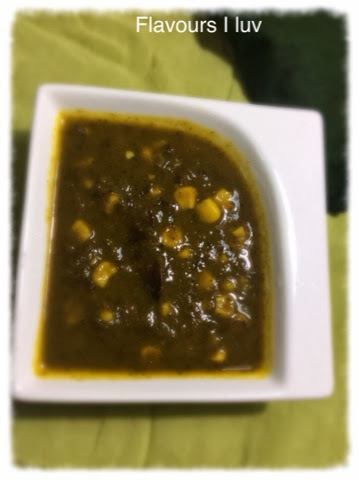 Makai Palak is a lightly spiced curry made with Spinach and Sweet Corn. The crunchiness and tangy ness of Corn in each and every bite is really amazing. The sweetness of the corn goes very well with the slight bland taste of spinach or palak. 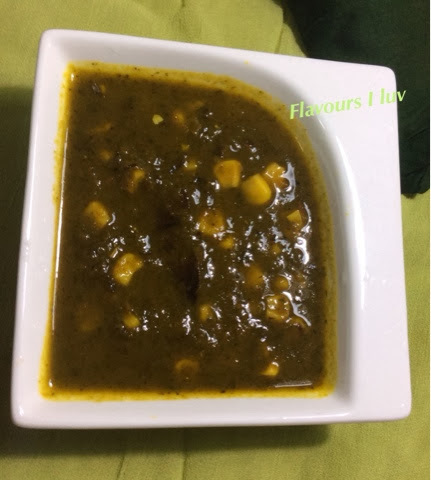 Extremely healthy and obviously yumm.....This palak corn curry goes very well with Naan or Bhatura. Trim the hard and thick stems of Spinach and wash it well. Heat enough water in a pan and add 1/3 tsp of sugar in it. Grind the Spinach leaves and make a smooth purée. Grind together tomato, green chillies and ginger and make a paste. Heat oil and butter in a pan and add cumin, cardamom, cloves, cinnamon and bay leaves. When cumin become golden then add the tomato purée and turmeric powder. Saute till tomato purée start leaving the oil. Now add Spinach puree, crushed kasoori methi and boiled corn and simmer for 2 minutes. Add salt, sugar, garam masala and fresh cream and simmer for a minute. Add lemon juice and serve hot. Sweet corn in spinch gravy.......yummilicious! lovely, tasty curry. Nice combo of sweet corn and spinach. Very different combo curry.. Looks good & yum.